A few days ago my neighbor asked me if I wanted some apples, because she had so many on her tree that she and her family could eat them all. Well, of course, I said yes. I'm never going to turn down free fruit of any kind. 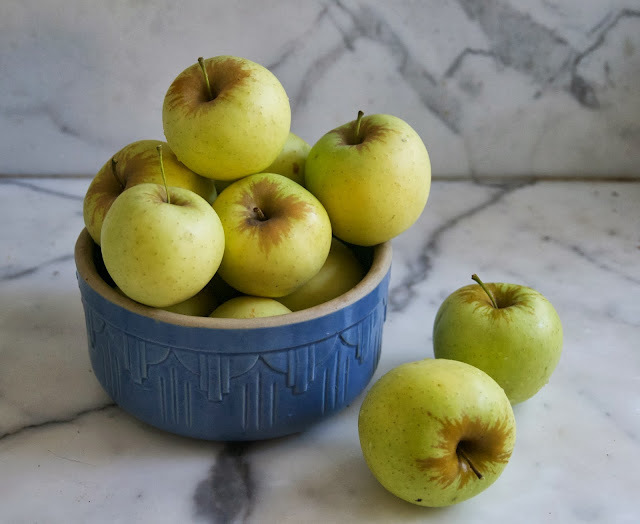 She gave me a big bag of these beautiful apples, though, I'm not sure of the variety. Then, she proceeded to tell me about the apple strudels she made growing up in Eastern Europe. That's how a recipe is born. A suggestion made in passing while picking apples from an old tree on the side of a garage. 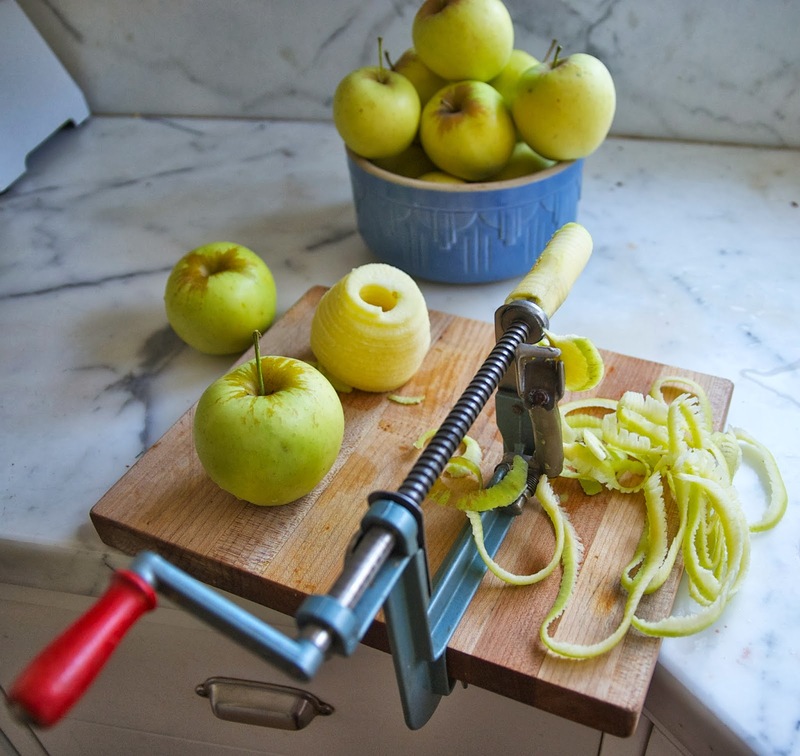 She told me that she always grates the apples but I have this nifty apple peeler that also slices and cores the apples. It's so convenient to use that I went with the thin slices that it produces. I also decided to use the whole wheat fillo dough that I had in my freezer rather than make my own. While there are many wonderful videos on the proper way to make your own dough, I took the quicker route. 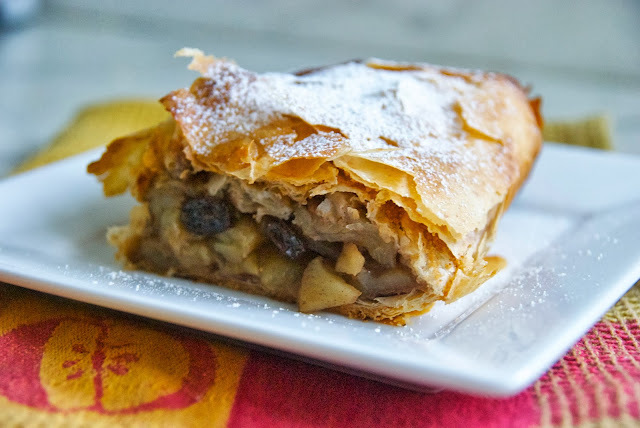 A strudel made with fillo dough is not such a daunting, time consuming process. You do need to get your filling ready before you your start buttering each layer of the dough, fillo is very sensitive to air and dries out quickly. It's best to keep the unused portion covered with a damp cloth as you butter the layers. I used Earth Balance, a non dairy butter for this. 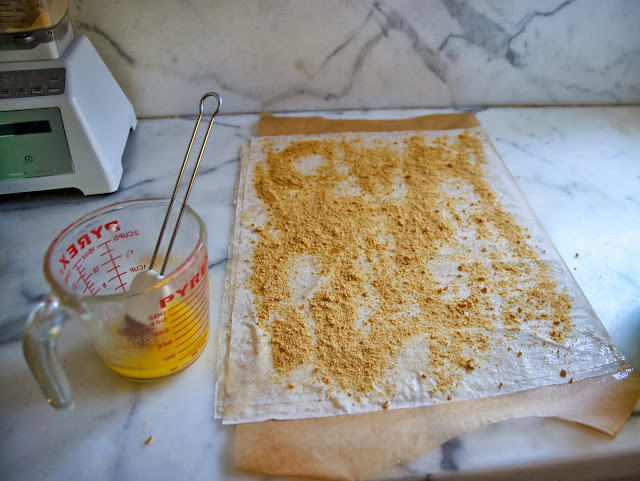 Traditionally, bread crumbs are used to in strudel, I assume to help absorb the moisture from the apples but I went with graham cracker crumbs because I had them on hand. 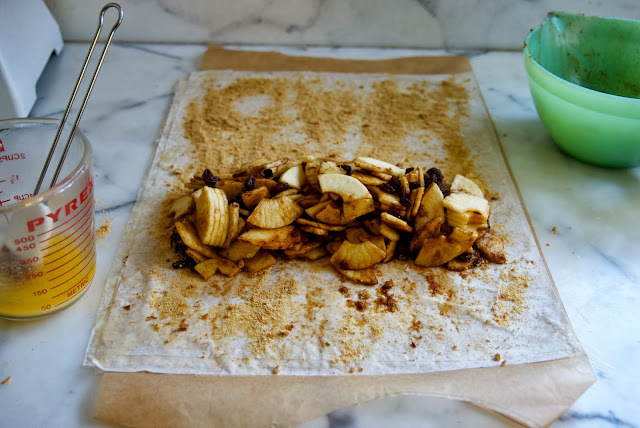 The sliced apples are mixed with a little brown sugar, cinnamon and raisins before you pile them on the 5 sheets of fillo dough. Then, it's just a matter of rolling up the dough (this is easier if you lay the dough on parchment paper first) and folding in the ends. You want to place it on a well greased pan and brush some more Earth Balance on the top to help it brown nicely. Look at those wonderful crispy layers of pastry. Let it cool and then dust the top with a little powdered sugar before you cut it. I do suggest using a serrated knife for a cleaner cut. Defrost the fillo according to the directions on the package. 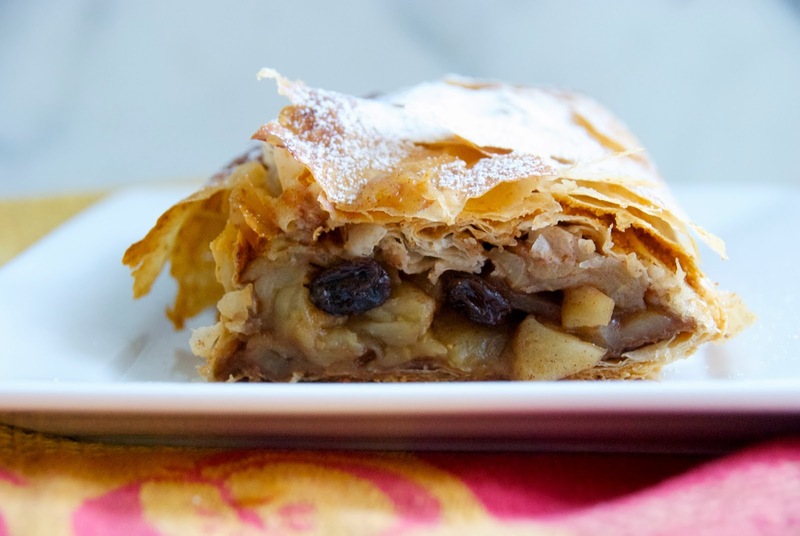 Mix together the apples, sugar, raisins and cinnamon. 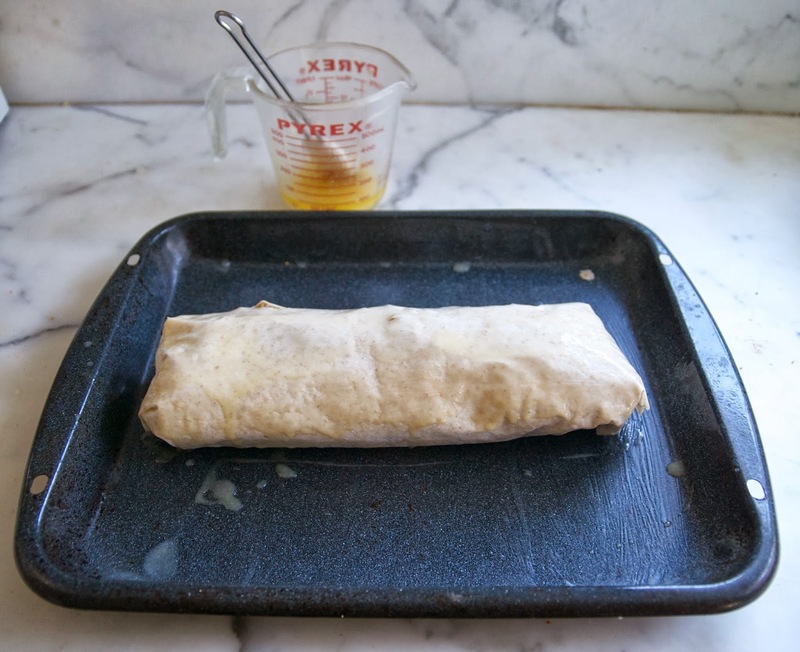 Lay one sheet of fillo on the parchment paper. Lay another sheet on top and butter it as well. Continue this process until you have used up all five sheets. Sprinkle the graham cracker crumbs evenly over the top. 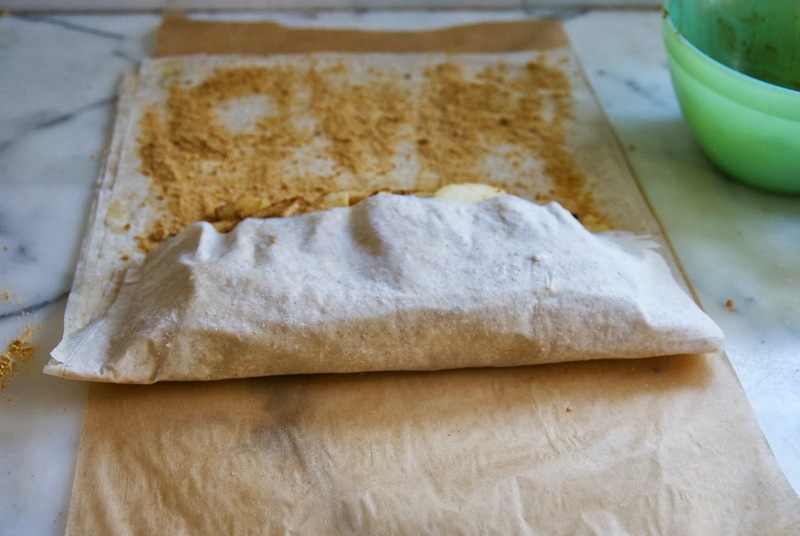 Fold the dough over the apples by lifting the parchment paper. Continue to roll the dough around the apples. Tuck the ends under the roll. Brush the top with butter substitute. Bake on a buttered pan for 35-40 minutes until golden brown. Allow to cool and dust the top with powered sugar.